Sci&Fi needed a more proper web adress than a dot wordpress website. For this reason we have moved to another server and onto a new website. Hence this one will not receive any new content! We will keep it live for a while though. 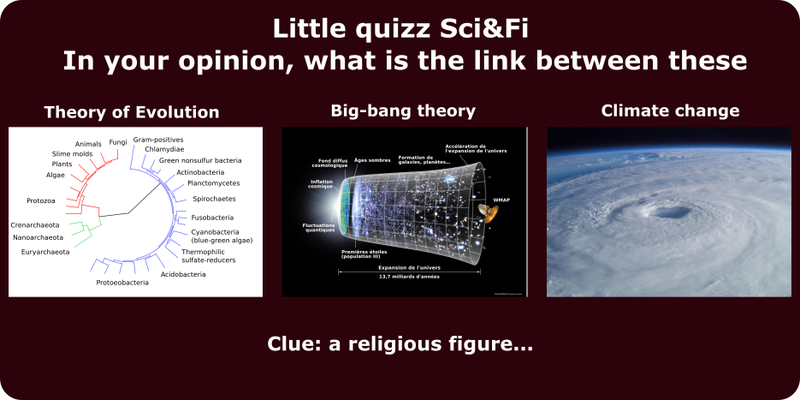 Anyways, we have now moved onto sci-and-fi.com/en/, come join us there! What is several hundreds of meters long, moves at an unbelievable speed, could destroy humanity and is worth billions of dollars? This year, the New-Horizon probe has attracted quite a bit of attention but another massive event happened that went a bit under the radar. In July, an asteroid made a fly-by. Its particularity ? It could contain a billion dollars worth treasure inside of it. Sci&Fi investigated a little deeper into the 2011 UW158 asteroid. If you have liked this content you can join us on Facebook or on twitter @Sci_and_Fi. There has been much hype in the media about water on Mars, about the latest discovery of ravines etc.. At Sci&Fi, we are not too fond of science being made sensational and inaccurate. If you were to pay close attention to what a variety of sources have to say, it seems that we have discovered at least three times that there is water on Mars. Well it isn’t so!! Follow us on a little historical journey on what scientist have actually said and what we currently know; truth is always more interesting than what they’ll have you believe. We could have started the journey much earlier but the first conclusive ground observations were brought by the Phoenix Lander. The latter is a static laboratory unit which was “parachuted” on Mars in 2008 and was operated by NASA. Its landing site was chosen to be next to the Martian Arctic; a place a bit like our own Arctic region where there is a permanent sheet of ice that seemed to retreat and advance according to seasons. Originally, it was thought to be composed of CO2 ice but since the launch of the Mars Odyssey Orbiter in 2002, there was a strong suspicion that there was a good amount of water ice. Hence, an area close to the Martian Arctic was chosen since one of the main mission of the Phoenix Lander was to search for water ice below the surface and to look for organic molecules. Its other goal was to monitor the local weather on Mars for as long as it could operate. The Phoenix Lander allowed to make four main findings. 1) The robotic arm having removed the top soil, some white chunks were visible. After four martian days (called sols), they started disappearing. This is the process of sublimation of ice (tranformation of a solid directly into gas). At these temperatures, CO2 ice would have sublimated much faster. 2) Phoenix had an instrument that baked the samples put in it and analyse the gases coming off. When they put subsurface samples into it, scientists detected water vapour towards 0°C and also at really high temperatures (from 295 to 735°C), meaning that some minerals had some H2O in them. Magnesium and Calcium perchlorates (chemical formulas Mg(ClO4)2 and Ca(ClO4)2) among others were detected. These salts are not only highly soluble in water, they also attract it and lower its freezing temperature. Calcium carbonate (CaCO3) has been detected in soil sample, making up 3 to 5% of the total weight. This rather high percentage suggests that these carbonates were formed via similar processes to those occuring in seawater for example. On Earth, calcium ions and dissoved CO2 gas can bind together in a body of liquid water then the calcium carbonate drops at the bottom of the water body. Therefore, in the past, Mars must have had regular (which could be either be daily, seasonal, or permanent) presence of liquid water. It does not give any idea on the amount water present though: there could have been deep oceans or thin films on the surface. Summer: there is a higher quantity of dust and water vapor in the atmosphere. Occasionnally, some cirrus-like clouds form over 10 km of altitude. Indeed, on Mars, H2O seems to need a temperature of -65°C to start forming crystals. The surface of the Arctic looks like some dry frozen places on Earth, with these square-ish formation on the ground: the polygons in the above pictures. Autumn: the temperature falls, leading to the formation of clouds lower in altitude (max 4 km in altitude) and staying for a while during the night. It may start “snowing”, that is water ice crystals fall from the clouds; the temperatures are not low enough for CO2 ice (also know as dry ice) to form. During the day, however, ice on the ground sublimates back into vapor and clouds clear up. Winter: the temperatures are low, clouds form during the night and remain longer (probably all day). In these conditions, the water ice stays on the ground thereby creating a persistent ice sheet. It is probably augmented by dry ice later on when temperatures go down sufficiently for CO2 to freeze (-120°C on Mars). There is also less dust in the air. Spring: unknown since the Phoenix Lander did not survive past five months and could not be recontacted again. It has been photographed later on covered in CO2 ice during winter, the electronic component and the solar panels won’t have survived the damage. 1) Ground observations confirmed that near the Martian Arctic there is water ice under the surface even in summer. 2) There is a sort of water cycle near the Martian Arctic where water vapor condenses in clouds and drops as ice. Depending on the season, it will either sublimate or remain as ice sheets or chunks on the surface. 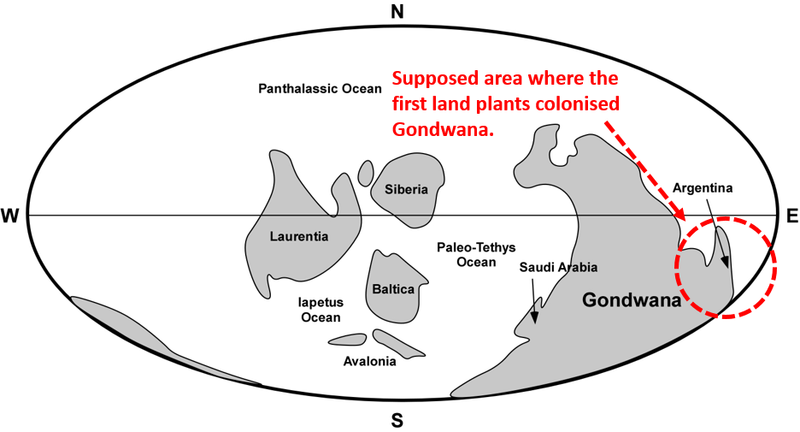 3) Various salt residues point to the fact that there must have been a wetter climate with at least seasonal liquid water bodies when temperatures were above zero. Does this say anything about present day liquid water? No. Does this say anything about past or present Life on Mars? No. But H2O is present, in small quantity, in one of two states, vapor or ice, never liquid. 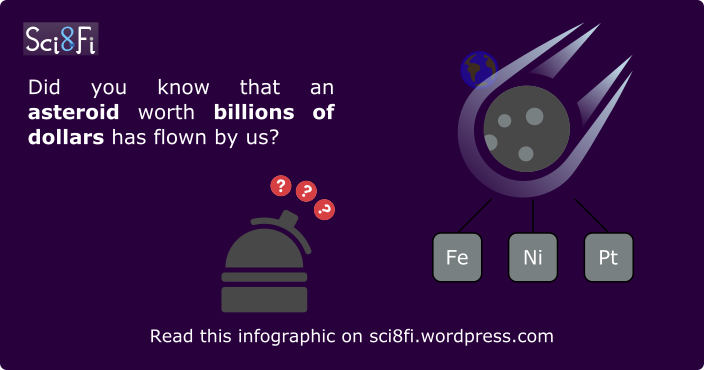 Interested by Mars, have you read our infographic “The planet of robots“? 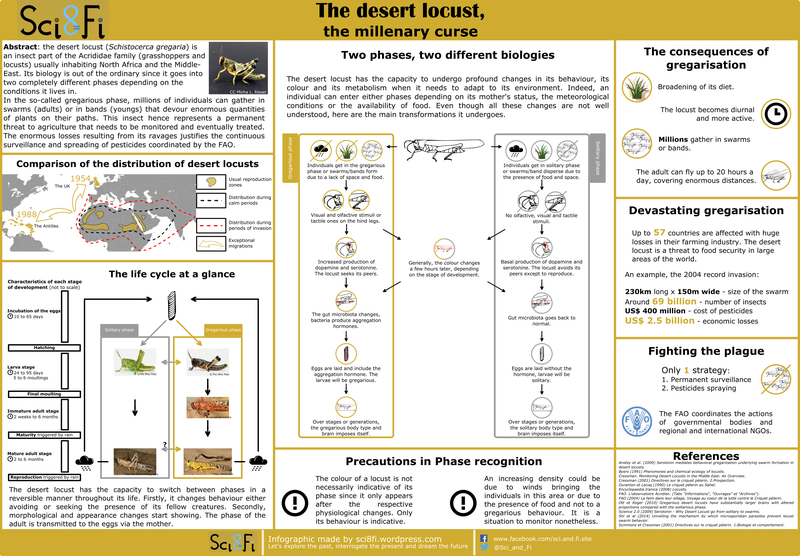 It is one of the ten Biblical plagues but a source of food; harmless when alone, a curse when grouped in swarms of millions of individuals… the desert locust. It’s biology is complex and changing, it can turn into a monster devouring everything on its path in a matter of days if the conditions force it too. As it was a fascinating subject, we decided to do something bigger than our usual infographic, we made a a poster out of it.